Eliminate Wind-Dampness, warm the Meridians, remove stagnation. Minor aches and pains of muscles and joints associated with simple backache, shoulder pain, arthritis, strains, bruises and sprains. Sports injury or other traumatic injuries to muscles and tendons. Neuralgia, rheumatism, osteoarthritis, rheumatoid arthritis. 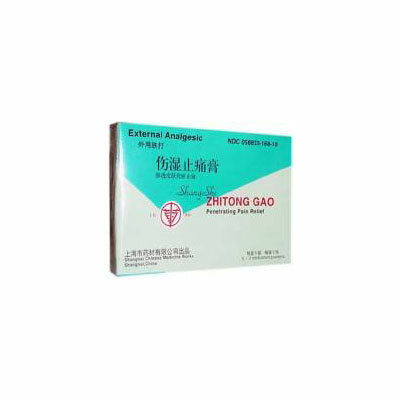 This is a popular and commonly used herbal plaster in China. It is convenient to use and the herbal medicines are released quickly; therefore, pain relief is rapid. Minor aches and pains of muscles and joints associated with simple backache, shoulder pain, arthritis, strains, bruises and sprains. Sports injury or other traumatic injuries to muscles and tendons. Neuralgia, rheumatism, osteoarthritis, rheumatoid arthritis. The affected are should be cleaned with gentle soap and warm water before application. Adults and children 2 years of age and older, apply one plaster to affected area not more than 3 to 4 times a day. Children under 2 years of age do not use; ask a doctor. For external use only, avoid contact with the eyes and mucous membranes. Do not apply on wounds or damaged skin. Do not bandage tightly. Do not use with heating pad or apply external heat. Use only as directed. Do not apply on wet or sweaty skin, extremely hairy surface of skin. Stop use and ask a doctor if excessive irritation of the skin develops; condition worsens; symptoms persist for more than 7 days or clear up and occur again within a few days; redness is present, conditions affect children under 12 years of age. Do not use if you are pregnant or nursing. Keep out of reach of children. If swallowed, get medical help or contact a Poison Control Center right away.